Alan Stubbs is convinced Hibernian will end their wretched run in the Scottish Cup and hopes to be the manager to bring the trophy back to Easter Road. Hibs take on Falkirk on Saturday looking to book a third final appearance in four years but have not won the tournament since 1902. "We are very aware of our history," Stubbs told BBC Scotland. "It may be someone else standing here in years to come, but it is going to change. If it's this year, fantastic." Having guaranteed Hibs' place in the play-offs, Stubbs found it tricky to pick between promotion and ending the club's long wait for a third Scottish Cup success when asked for a preference. "Promotion is obviously very important for the club with what it means to be among the elite," added former Everton and Celtic defender Stubbs, who is nearing the end of his first season in management. "But the Scottish Cup is special and it's been too long, especially for a club of this size. "It would nice to do the two." 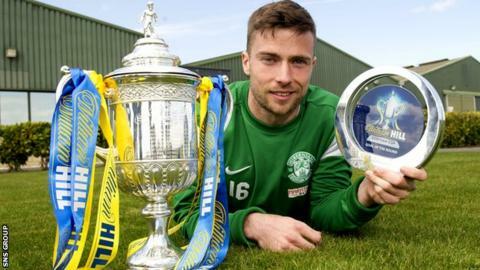 Paul Hanlon and Lewis Stevenson are the only players left at Easter Road who featured in the 2012 and 2013 finals, while Jordon Forster and Danny Handling played in the latter game. "The players have got an opportunity to put something right and if that's not motivation I don't know what is," added Stubbs. "As a player, you want to be looking back at big days in your career - and certainly getting to a Scottish Cup final is a big day. "I want it too. To get there in my first season as a manager. I'm really looking forward to the semi-final. "But I don't want to put too much pressure on the players. They have to be relaxed and calm to know exactly what their jobs are." Hibernian beat Falkirk at this stage in 2013, coming back from 3-0 down in a remarkable match. The Bairns may be nine points behind their Championship rivals but will be confident since they are unbeaten against Hibs in three matches this season, winning twice and coming back from 3-1 down to earn a draw. "They've gained the upper hand in terms of results," conceded Stubbs. "But this is a different game. "We'll have the upmost respect for Falkirk and it will be a tough game but if we feel that on the day, if we play well, we have an opportunity to get to the final." Right-back David Gray is missing with a hamstring injury, while on-loan players Keith Watson and Martin Boyle are cup-tied. Stevenson, who was the winner of goal of the round for his quarter-final strike against Berwick Rangers, said he was looking forward to "a massive game" at Hampden. "We've not beaten them this season but I think a few of the games could have gone differently," said the left-back. Looking back at the recent finals, Stevenson admitted: "Those days still haunt you. "To get to three finals in four years would be a good achievement but you are only remembered for winning."